No. 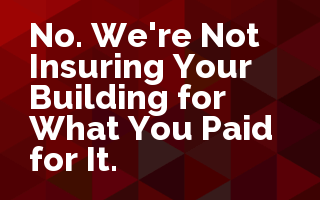 We're Not Insuring Your Building for What You Paid for It. What's the difference between replacement cost and market value? Can I simply insure this bulding for the mortgage amount? What do you mean, there might be a coinsurance penalty? These are some of the questions that Patrick is going to try and answer in this session. Join us and find out what valuation and coinsurance are all about. One of the great mysteries to insurance customers is how the company came up with that limit for their building. Whether we’re talking about a homeowners’ policy or a commercial property policy, our customers don’t really know how we got that limit. To be honest, many of us don’t know, either. This session will discuss different building valuations, how companies get to the value that they finally put on the policy, and how this impacts another great mystery in insurance, the coinsurance provision. Define different building valuation methods. Discuss the importance of making the best possible building value estimate. Apply the coinsurance provision from a commercial property policy. Compare the coinsurance provisions of commercial property policies and homeowners’ policies.